Gosh, pretty packaging on the Tommy Girl and Eternity summer things… not that I’m tempted, but, ooh, pretty. Indeed, the packagings are pretty. I just wish the contents would make the bottles worth keeping. I am with you on the Eternity one – so pretty. I wish I could make windows look like that. All gauzy, billowy and delicately shadowy. I’m wondering when someone will try bottling a plain alcohol/water mixture and selling it as a “fragrance”? Some of the stuff out there is not much more than that. The original Tommy Girl is already pretty darned fresh, although that said, I think I like it better than DKNY Pure. I’m laughing at the cruel timing… we woke up to -15* this morning (not counting the windchill). Summer. Ha. ;D I like the Eternity packaging, though. It’s just like everything else. The announcements come before the launches, which precede the actual season, iso we get to read about summer fragrances in January. The clothing stores are clearing out their winter merchandise right now, and the swimsuits will show up in a few weeks. Then in July, when it is pushing 100 degrees and everyone is getting heat stress, the stores will be full of sweaters and coats. It’s nice to think summer is coming though, right? I’m already dreaming. In March, it will be nice. In January, it’s so very far away it just depresses me. Where I live, March nearly IS summer. OK, actually summer doesn’t arrive until late April. And it doesn’t end until late October. Here, March is still FIRMLY winter… typically our snowiest month… but at least temps are in the 20s ABOVE zero, and we know spring is just around the corner, with summer not too far behind. Winter can start as early as mid-October here, and I’ve seen snow on April 30 more than once. I’ll take your summers and my winters. I spent my early childhood in Michigan, so I do know about long, snowy winters. I seem to recall going trick-or-treating in the snow at least once, and I have been pelted with snowballs at Eastertime. I don’t really miss any of that, but the 5 to 6 months a year of 90+ F temps here really does get old, especially when our nighttime lows barely get below 80. I find that hot days are easier to take if you at least know you will get some relief at night. My ideal year would look something like this: winter from mid-November through the first week of January; spring the rest of January through June; summer for July and August, and Indian summer/fall for the rest. If I can’t have that, I want a place with highs around 80* and lows around 60* year-round. Highs around 80 and lows around 60? I think you just described southern California or Hawaii. Unfortunately, So. Cal. is already too crowded–no doubt because it does have that type of weather. Hawaii sounds nice, but it is expensive and remote from everything else. Of course, if you are in Hawaii, maybe you don’t care to go anywhere else. Ditto — they did a great job with the bandana motif. I’m the odd one out here. Not that I dislike it – it’s pretty. But it took me a long while to think “bandana” and have it make sense. At first glance, it looked like the red and white Nordic sweater I have, and I couldn’t make sense of THAT for a summer fragrance at all. to me it looks like America and the orient had some kind of collision on both the bottle and the box. Well its not an oriental but an American fresh – with notes of BOTH fresh water AND fresh breezes! Whats paisley doing here again? I thought it looked like a lace doily on a red background, as if it would be a rose-centered scent. I didn’t get the bandana connection at all. Thank you, Kaos! THAT’S what the box reminded me of! Love that box and the Eternity bottle. Can’t say any of the juice interests me though. Summer **shudder** 95 degrees with 95% humidity. Pretty packaging here, but doesn’t really seem like anything earth shattering. DK’s looks like an NYC skyscraper. Very appro. Robin: thank you very much for putting this together for us. It is very interesting to see the lovely bottles. The TG box is reminiscent of the bandanas that hippies and surfers used to wear in the ’60’s. People like to put them on their dogs too. I look forward to smelling the summery scents as I’m an aquatic lover. Escada is now putting out their summer L.E. in the fall before the summer it’s meant for. Am I the only one secretly excited about this new CK One Summer? How great is the theme of a beach dance party? I’m skeptical it will come anywhere close to evoking that in reality, but I guess the marketing has worked on me because I’m looking forward to sniffing! I’m skeptical as well, but can you imagine? Suntan lotion, sweaty bodies, fruity frozen drinks, barbecue smoke, warm salty air, sun-baked sand…something for Christopher Brosius to consider, methinks. I’ll still check out the CK, though – I’ve never purchased one of their summer editions, but feel oddly moved to this year. The Eternity packaging is plain gorgeous. Do not wear Eternity, am not a woman, can’t stand florals, but I want. That. Bottle. The box and bottle for the Eternity flanker appear to be one of Albert Richards’ or Jane Cox’s radiographs (which is to say x-rays) of flowers, tinted. You can buy posters. I’m in love with the Tommy Girl box and bottle, but that colour is as completely wrong as possible for what the contents sound like they’ll be. I don’t really see how you can put anything but an oriental in a bottle that’s practically maroon. 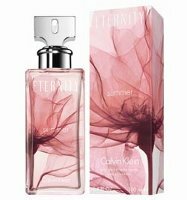 That Eternity Summer packaging is so pretty!